What Happens During an Innovation Project? A project begins when you select an innovation challenge worth hundreds or even thousands of crores in new revenue and cost reductions. Your biggest challenge may come from any area of the business, from operations to strategy, from new product development to human resources management. They key is to select a challenge that cannot be met with your current activities – only an innovative solution can meet the challenge. Next, you nominate a team of your employees to work on the challenge. We lead, direct, train, coach and mentor your team through a systematic process to conceive and develop one or more innovative solutions. Activities include primary and secondary research to understand all the relevant dimensions of the challenge, brainstorming for original solutions, and rapid, iterative prototyping to gain experimental validation that the solution will be successful. Click here to read more about our process and our methods. What Long-Term Effects will Our Organization Experience? In addition to a profit-building solution to an immediate business challenge, your team will gain a set of world-class innovation skills that they can apply to other challenges. If you wish to establish a corporate culture where profit-increasing innovation happens regularly, we can lead a project dedicated to this particular challenge. Based on the experience of the world’s most innovative companies, we will work with your team to select the most appropriate policies, programs and structures to make innovation happen consistently and successfully in your company. What Engagement Models are Available? 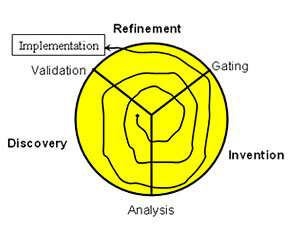 Original solutions proposed with limited testing and validation. *Depends on complexity of challenge selected and location of field work. ** Depends on percentage of employee work week allotted to the engagement. What Assurance Can Be Given of a Successful Project? Innovation work is unlike other kinds of consulting because the solution is not known prior to the engagement. You specify only the challenge to be met, not the solution. Your employees supply the domain expertise. The Innovation Workgroup provides the innovation tools and methods, along with project leadership. The solution is invented by your team under our guidance during the engagement. The track record of past success speaks for the value of our innovation system. Moreover, we are willing to work on a gain-sharing model for those clients who wish to minimize risk.